mark it as a setting for a spectacular salute to the sport and a place where horses, trainers, jockeys and owners seemingly are united in efforts to make each season better than the last. The track, operated by the Del Mar Thoroughbred Club, sits just a few furlongs from the shimmering Pacific Ocean about 20 miles north of San Diego and 100 miles south of Los Angeles. Headlining the record $6,775,000 stakes program, of course, is the 15th running of the $1-million, Grade I Pacific Classic, to be contested by 3-year-olds and older Sunday, August 22, at 1 1/4 miles on the main track. It is one of six Grade I events slated for the meeting. Top prospects for the track's signature event include Lava Man, Congrats, Minister Eric, and Perfect Drift. The season begins with a flurry of stakes action over the first five days, spotlighting two of the track's top turf tests of the meet, the $400,000 John C. Mabee Handicap on Saturday, July 23, and the $400,000 Eddie Read on Sunday, July 24. Both are Grade I events at 1 1/8 miles on the Jimmy Durante Turf Course, with the Mabee matching fillies and mares aged 3 and up and the Read open to all horses, aged 3 and up. The highlight of opening day is the $100,000 Oceanside Stakes, annually one of the track's most popular stakes with horsemen. The 3-year-old test on grass at a mile has been split 23 times in its 58 runnings, including the last 16 years in a row. It serves as one of two major preps for the track's top 3-year-old race, the Del Mar Derby. Del Mar's two premier sprint stakes, the Bing Crosby and Pat O'Brien handicaps, have both had major purse increases and should attract the top sprinters in the country. The Grade I Crosby, slated for its 60th running on Sunday, July 31 at six furlongs, will have its purse elevated from $250,000 to $300,000. The Grade II O'Brien, which will be presented for the 20th time on Sunday, August 21 at seven furlongs, will rise from a $200,000 test to one for $300,000. The Crosby, which for the last nine years has been designated a Breeders' Cup race, will have that title removed for the 2005 renewal. The O'Brien, which was a Breeders' Cup race from 1990 through 1995, then again last year, will continue as a Breeders' Cup event this summer. While the horses are on-track stars at the shore, trainers and jockeys get attention, too. Perennial training leader Bob Baffert will be trying to regain the title he held for 7 straight years vefore losing it to Dough O'Neill in 2004. O'Neil had 28 winners out of 126 starters in 2004 with Jeff Mullins in second with 24 and Baffert third with 17. Corey Nakatani will be back to defend his title from 2004 where he narrowly beat out Tyler Baze with 54 wins to Baze's 52. In addition to the racing, there are many of other events planned daily. Lots of concerts, movies, handicapping seminars, giveaways and family fun are scheduled. Del Mar is a great place to take the family for the weekend and even has a nice playground in the infield to keep the kids busy. So come on out to Del Mar this summer and have some fun! Post time for the majority of race days is 2 p.m., with the exception of Fridays and the 1 p.m. start on Pacific Classic Day, August 22. For the most part, eight races are slated on weekdays with 10 on Saturdays and nine of Sundays. I have been asked many times whether there is a horse racing system that really works. The quick answer to that question is, yes, but the longer, ambiguous, but more accurate answer is yes and no. I am not trying to be cute, just letting you know how complicated the question of horse racing systems really is. 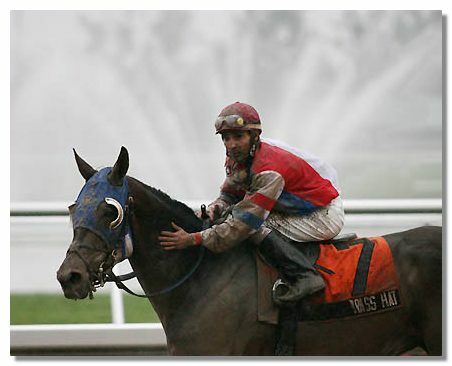 The reason that I say yes, is because horse racing systems can make money for a smart player. The reason that I say, "and no," is because they don't always make money. If you use a horse racing system that works at one track or in one kind of races, it may very well make you money, but if you try it at another track it may lose. You have to do research so you will know what works at each track and in each kind of race. That means keeping accurate notes and planning ahead. The notes that you keep may not make a profit today or this week, but in the long run, they will make money if you use them wisely. An example of my own success with note keeping and betting on the horses is the bets that I make money on at Aqueduct. When the races go from Belmont to Aqueduct on the New York racing circuit, I make money playing certain bets in maiden races. I make money because I kept track of what running style wins at Aqueduct and also which trainers were winning with that angle. Early speed doesn't hold up as well in the maiden races at Belmont as it does at Aqueduct. While Belmont seems to favor horse running off the pace a bit, Aqueduct favors front runners. So I watch maidens lose at Belmont after being on the front end or flashing early speed and wait for them to start at Aqueduct. They often get to the front and take the lead at Aqueduct but instead of fading as they did at Belmont, they win. They often go often at good odds because the average bettor sees that they faded at Belmont and expects the same results at the "Big A." This is just one example of long range planning that pays off and if you are investing in horse races, note keeping and long range planning will pay off if you stick with it. If you expect quick profits and easy work, then forget about betting on horse races, but if you are willing to work hard and think ahead, you might make a little profit from your bets. It is a tough game and you have to love it in order to be able to put forth the effort to win.